My latest Indy custom is completed! Here is my showcase. Willie Scott was performing a dance and song routine when Indiana Jones entered into the Shanghai nightclub for an artifact exchange with the crime lord Lao Che. But Willie unwittingly finds herself turned into a pawn in the deadly negotiations when Lao Che double-crosses Indy by trying to keep the artifacts for himself and poisoning Indy. After Willie realised that Lao Che held little regard for her well-being, she followed Indy as they escaped from the resulting nightclub shootout. 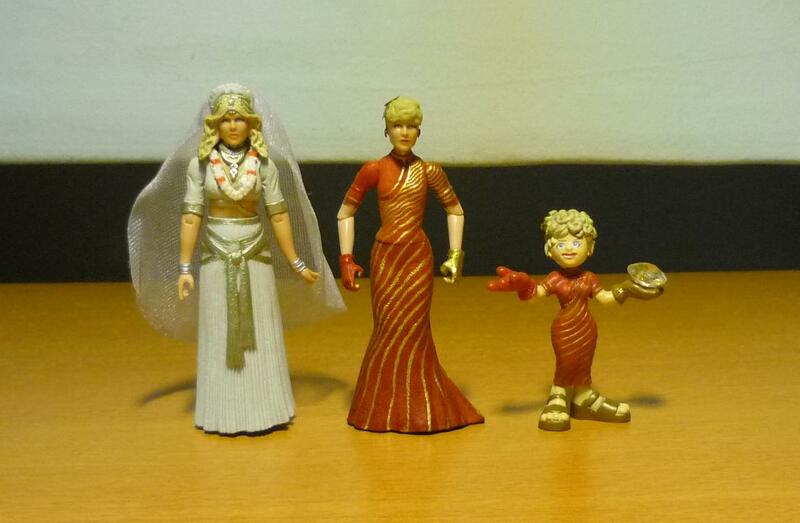 Hasbro had produced a Willie Scott figure as part of its line of “Temple of Doom” Indy figures, but she wears the white sacrificial dress as she was being prepared to be sacrificed to Kali by the Thuggees. 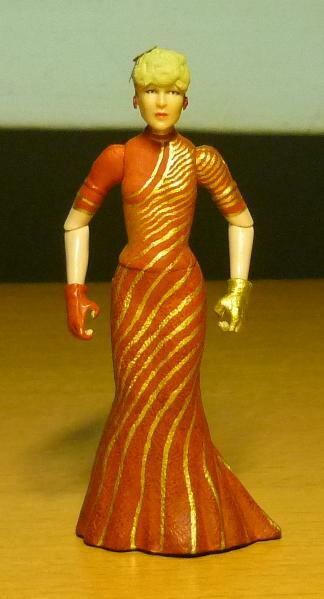 On the other hand, the Indiana Jones Adventure Heroes Willie Scott figure wears the red dress that Willie appeared in as she did her performance at the start of the movie. And therefore, I was inspired to customise a red dress Willie Scott, since I know of a suitable female figure to use for the torso and dress. The problem was in trying to find an extra Willie Scott head to use for the custom, as by now no one was selling Willie Scott. I had initially thought of finding a figure with her head likeness closest enough to Willie to use for the custom, that was, until I found a shop at CSC which was still selling the Willie figure. Firstly, Mara Jade’s arms were transplanted to the torso. Fortunately, her hands were already wearing the gloves, just as Willie Scott did in “Temple of Doom”. 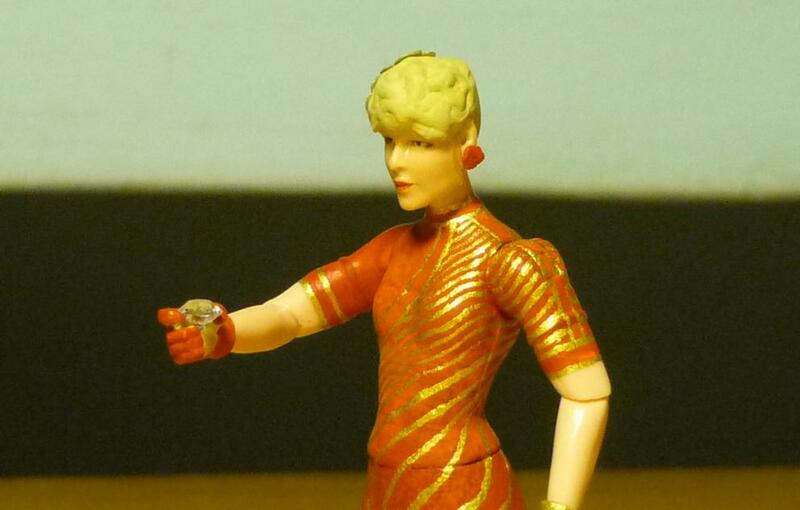 The rest of the work on the torso and dress consisted of using epoxy to sculpt the top of her dress, and painting the red dress as well as the gold patterns. I needed to keep track of the patterning as it spiraled down the dress, in order to make sure that every line is accounted for without bunching up or leaving too much of a gap. As for the head, the long hair was first cut off, and then the sides and back were dremeled down. The ears were transplanted over from one of my many extra Mutt Williams heads. 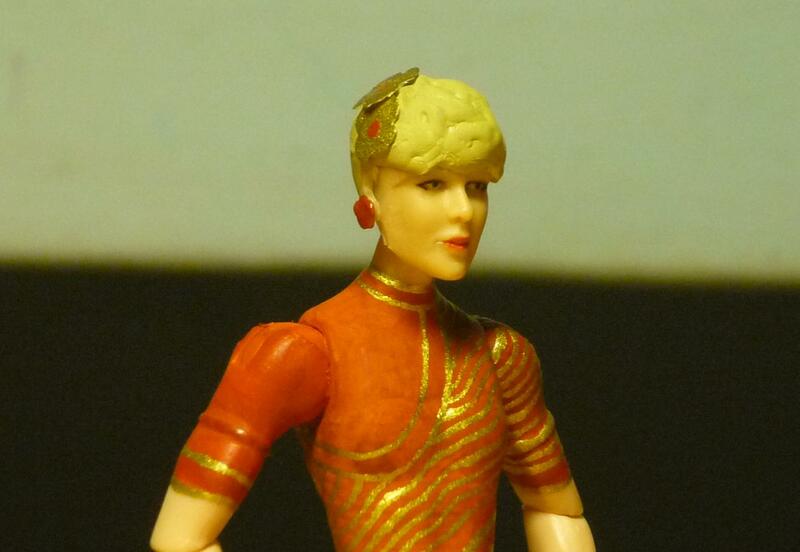 And epoxy was used to sculpt the hair on the back as well as the curly pattern at the front. The earrings were flower deco that I cut off from some souvenir, while the gold flowers on the head were made from paper. Willie picks up the diamond, only to lose it during the nightclub melee. But thanks to Willie’s help, Indy manages to get his hands on the antidode and cures himself of the poison. Just in case anyone wants to know exactly how low does the back goes.